Halloween is here and it doesn’t have to be a dieting nightmare. Here are a few tricks to take the fright out of dealing with all those treats and how choosing the right indulgence won't keep you running back for more! Be Choosy With Your Treats- You can still take part in the Halloween festivities without depriving yourself completely. If you want to have a few pieces of candy, go for the fun-size version vs. full size. Look at the nutrition facts panel too prior to eating so you can gauge how much you want to allot yourself. 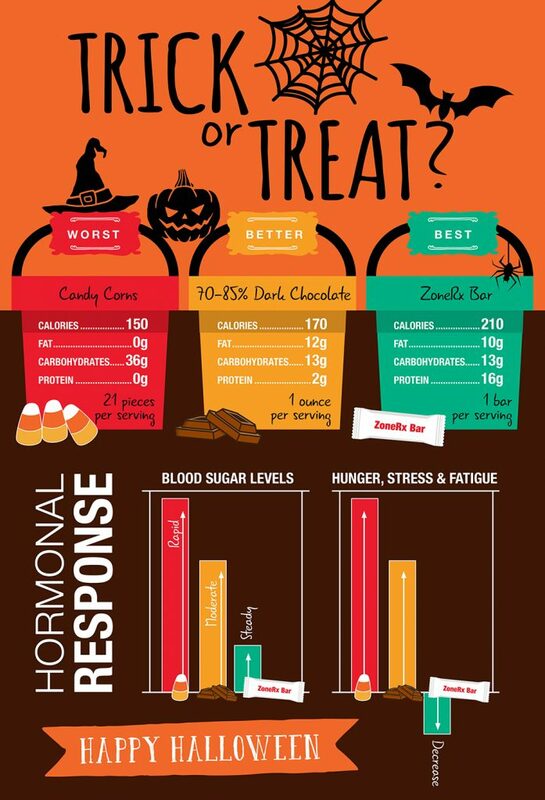 While a fat-free option like candy corns or fruit-snacks might seem like a better choice, it can actually turn out to be the worst since it will quickly spike your blood sugar leaving you running back for more (see chart below). Dark chocolate (70-85%) might be better giving you a hint of sweet without the spike in blood sugar due to its high fat content. Just remember to keep your portions in check since with higher fat, comes higher calories too. No matter what you choose, tying your treats in with some kind of protein or consuming after a meal or snack can help avoid spiking your blood sugar levels too much. Want to engage all your senses and satisfy your hunger without the guilt? A ZoneRx bar might be the perfect fix. Forego the Bargains - Halloween is only a day, but the candy seems to linger around until the holidays. You can’t go too many places without being bombarded with a bowl of candy or a sale at the supermarket or drugstore. If you've waited until the last minute to grab your candy, you're in luck as it lessens the amount of time candy is in the house and limits the temptation to dig into those bags before the big night arrives. Too late? Don't worry there's still time to avoid those deals! You'll need that willpower in the weeks ahead as they clean out the inventory and get ready for Thanksgiving and Christmas. Buy Candy You Don’t Like or Give It Out First - If you know Snickers and Reese’s Peanut Butter Cups are your downfall, avoid buying them altogether or make sure those are the first treats to go. Choosing candy that isn’t a big temptation allows you to exercise greater portion control. Better yet, not having it around avoids overindulging all together. Consider Non-Candy Treats - It might be too late this year, but if you live in a neighborhood with younger kids, consider giving out small bags with non-candy treats like Halloween stickers, pencils, tattoos, Playdoh or popcorn. With all the candy they’ll get, this is something fun for them to receive plus your waistline will thank you too! Eat Before You Go - Whether you’re going to a Halloween party, socializing with neighborhood friends or taking the kids out, make sure you eat before you go. By having a meal or snack with protein and healthy carbohydrates prior to leaving, you’ll be less apt to overindulge. Give It Away - Just remember, Halloween is only one day, and it doesn’t have to begin the slippery slope through the holiday season. If you have leftover candy, consider donating it or bringing it into the office for your co-workers. Let the kids choose which candy they like and put aside into small bags. Whatever is left over put in the freezer, save for the holidays or put somewhere out of sight to avoid the temptation to go back for more.